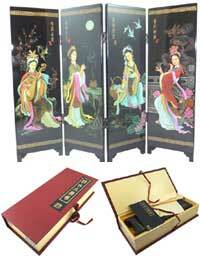 Tabletop Display Screens - Oriental Homeware - Oriental Gifts from Got-Bonsai? Supreme quality ornamental tabletop screens. Sadly the pictures don't do these justice. They are mini shoji or room dividing screens made for decorative purposes and covered in beautiful artwork with a glossy finish. They feature artwork on the front with further pictures and descriptions on the reverse side. Each panel measures 7.5cm x 24cm tall with the whole screen measuring up to 30cm (4 panel designs) or 45cm (6 panel designs). Each comes gift boxed with a cleaning cloth and an information card (in Chinese). When the box is closed it looks like a book. Fairly heavy for their size, these are high quality impressive items. Browse all Tabletop Display Screens products below. You can use the options on the left to filter the search.